A couple years ago I went down to New Orleans for a little fun vacation and took a guided kayak tour into the bayou. The tour company mentioned they did photo tours but I had no idea anyone would want to do a photo trip until I got out onto the bayou and went "holy crap, this is gorgeous!" 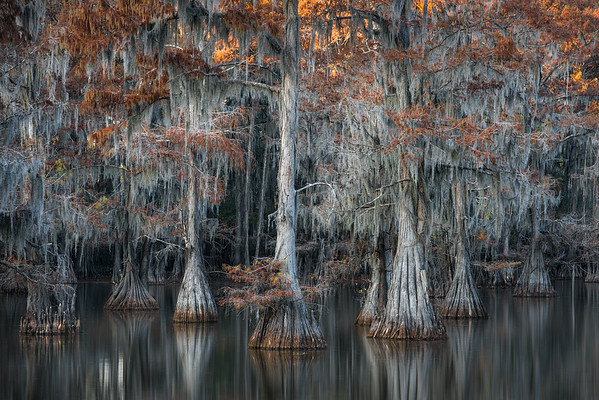 A few months later I saw a few photos of a similar (but different) bayou from David Thompson and I was blown away. I had to go back. While you can explore the bayou by land or by sea, exploring it out on the water is by far the better option. And of course there's multiple ways to get out on the water: there's motor boats, air boats, stand-up paddleboards, or my favorite, kayaks. And that was our plan! David arrived a day after us, but being the awesome friend and guide that he is, had pointed out this area for us to explore. We got here just as the light was dipping down, watched as the top of the trees lit up, then turned off, and eventually bathed the entire scene in even light. I loved the way the trees lined up in "V" formation -- just like in The Mighty Ducks, except frozen in place. The light at the top of the trees was a nice added touch!